﻿﻿ Dear Husband and I spent the weekend in the Detroit area, visiting a long-time friend. DH and I decided to take a tour of the African-American Museum of History. We were both pleasantly surprised by the lovely architecture, the interesting and informative historical features and the incredibly friendly staff (kudos!). If you get a chance, go! 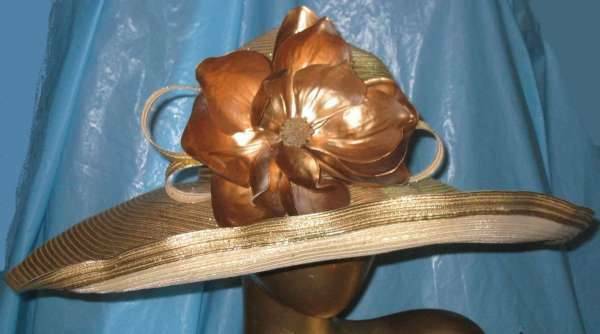 One of the ladies who'd contributed to the exhibit was quoted as saying, "I always wear a hat to church. I want to look my best for the Lord." Oh, how I wish we could all have that attitude! No, I do NOT think we should all be sporting hats and suits, but I think we should all look our best when entering into the Royal Banquet of Christ the King. I did NOT say THE best; I said OUR best. If your best is a pair of jeans and a clean t-shirt, then that is exactly what you should wear. I do not believe their is a dress-code for Heaven, otherwise, St. Francis of Assisi, barefoot and ragged, wouldn't have made it through the gates. However, most of us put more thought into what we wear to a concert or a class reunion than to what we wear to be in the Presence of Christ. I could rant on and on about the casualnes of our society, wearing pajamas to the grocery store, (really, I could rant on and on.....), etc. Let's just say that you should be nicely dressed for church. Nice enough for a funeral, nice enough for dinner at a upscale restaurant, nice enough for an evening out. If God doesn't rank that high up on your list of "things to get dressed up for", then your priorities are out of whack. No, God probably doesn't care what you dress like, but you and I know that how we dress affects US: how we walk, sit, carry ourselves, and generally how our clothing sets the tone for occasions. Church should be different than a fast-food restaurant, a sports event or the grocery store. We are in the presence of God....and "I want to look my best for the Lord." The vintage hats looks classy and modern hat can match with various attires. The hat looks beautiful!